Upright shrub with long slender, smooth green shoots and sparse narrow dark green leaves, hairy on the underside. 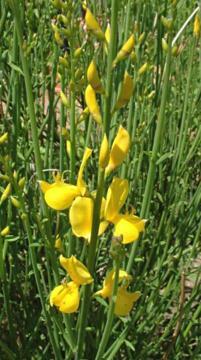 Fragrant, bright golden-yellow pea-like flowers are freely produced continuously from early summer to early autumn. Likes a hot, sunny, exposed location with well drained soil. Thrives in coastal situations and on chalky soils. Prune in spring to encourage compact growth, but do not cut back into the old wood. From seed or semi-ripe cuttings in summer.